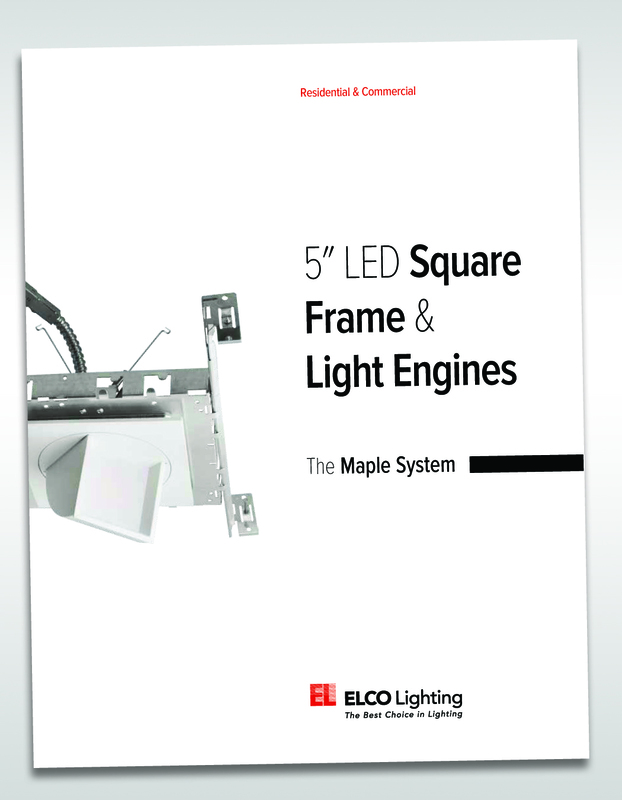 Elco Lighting, a national leader in innovative lighting technology, is pleased to announce our newest recessed LED product collection: The Maple System. The Maple System features 5" square new construction plaster frames in IC and non-IC ratings, depending on lumen package and trim style. The frame is only 2-7/8" tall at its greatest height, making it perfect for any shallow-plenum area. With today’s increasingly restrictive building codes, the spaces between floors are crowded with bulky insulation, HVAC components, security components, audio-visual, phone and cable lines and more. The Maple System’s diminutive height takes less space and helps solve many space issues. The housings include 120V/277V drivers, are airtight and UL rated for Insulation Contact and Wet Location. Maples System trims feature a high quality LED light engine and are available in reflector, baffle, adjustable pulldown and non-IC pulldown styles and offered in white and architectural bronze finishes. Available lumen packages include 16W 1100Lm and 26W 2000Lm for energy efficient performance. All 1100Lm fixtures are dimmable with TRIAC dimming systems and 2000Lm fixtures use 0-10V. All trims feature a frosted polycarbonate lens for durability and freedom from uncomfortable glare. The Adjustable Square Pull Down Trim is perfect for wall wash applications and, when spaced properly, can virtually eliminate the scalloping effect of round wall wash trims that so many designers abhor. Emergency Battery Back-up options are available. All of the amazing features of the Maple System make it perfect for Residential, Light Commercial and Architectural applications in high-end residential, retail, hospitality and almost any environment where beauty, functionality, style and high performance are demanded.